John Story, Finance Director at Story Contracting has been honoured as the UK’s brightest FD after picking up the acclaimed Young Finance Professional of the Year award at the FD Excellence Awards in London on Thursday last week. 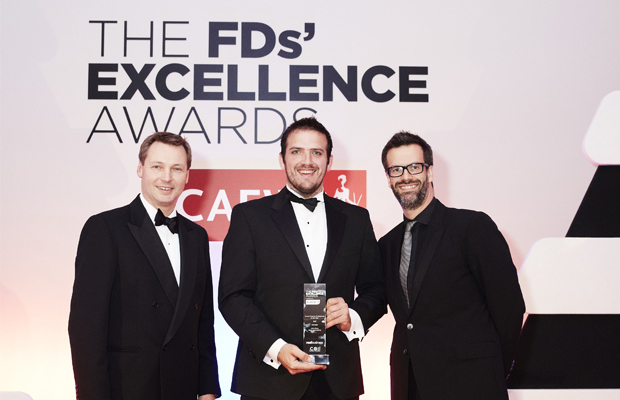 The awards, held in association with the Institute of Chartered Accountants in England and Wales saw outstanding FDs and financial service providers take to the stage in a stunning black tie event at the London Marriott Hotel to recognise their endeavours. The FDs’ Excellence Awards is the most prestigious awards programme for the UK’s best finance directors and their service providers with winners featuring from across business sectors. John, 28 has helped to secure financial arrangements for ambitious growth plans at Story Contracting since joining the family business last year. John’s ability to apply business plans and forecasts to the company’s growth strategy has helped to enable a 28% growth in 2014/15 and an expected further 25% growth in 2015/16 taking turnover above £80 million. This accolade follows recent celebrations by Story Contracting after one of its most successful years to date, ranking 33rd on the Sunday Times BDO Profit Track 100 league alongside sister company Story Homes who also featured. “I’m thrilled to have won such a prestigious national award, its a great reflection on how well Story Contracting is doing. I think its great for people to see, especially those starting their careers, that working in finance you can make a real difference within industry and that they are not just restricted to working for the big accountancy firms.